We like to live life to the fullest —that’s a fact. If this trip isn’t a testament to this, I don’t know what would be, so let’s begin at the beginning. It’s 14 days before our wedding day, we’re in the middle of finalising all the details, paying invoices and confirming and re-confirming bookings. My phone hasn’t stop buzzing from emails, calls and Facebook chats, which I constantly put on mute, or into the ‘deal with later’ basket. It’s my last day at work and I’ve just flown back to Melbourne from Broken Hill, after a rather large work assignment. It’s now time to put our feet up and concentrate on the one important thing, fast approaching—our wedding. But no, that’s not us… Instead, I quickly rush home from the airport, empty the ‘work clothes’ suitcase into the washing bin, just to pack it again 10 minutes later with ‘things for camping’. I grab a big tub, fill it with pantry stuff, strip the blankets off the bed into the vacuum bag. All this goes into the back of the Pajero and we’re ready to go. It’s 7pm on a Friday night, the traffic’s beginning to ease, and Google maps has estimated the driving time to Sydney Airport to be about 10 hours. Perfect—this gives us a solid five-and-a-half hours spare for servo stops and roadside naps before the 10am arrival to pick-up the in-laws after their 28-hour international journey from Russia. We stock up on Redbull and hit the road. Now, this is us. Sisters reminded me of how much we take the natural beauty of our country for granted. Absolutely astonished by the blue-tinted cliffs rising from the valley, Irina and Vladimir were speechless, and nothing could wipe the smiles of their faces, not the crazy, gaspy wind that almost blew us off the walking track, not a few drops of rain in the afternoon. After spending a couple of days in Sydney and ticking off the Harbour Bridge and Opera House, it was time to hitch up the Robson and hit the road. 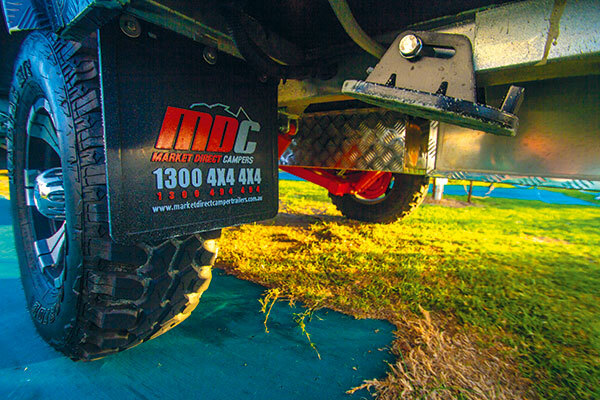 The process proved a little longer than anticipated, partially due to a couple of trips to Bunnings for the right tools to swap over the tow bar tongue, as well as finding the right connector for the electronics. Once we had these sorted, though, the DO35 clicked into place in seconds, and we were ready to go. 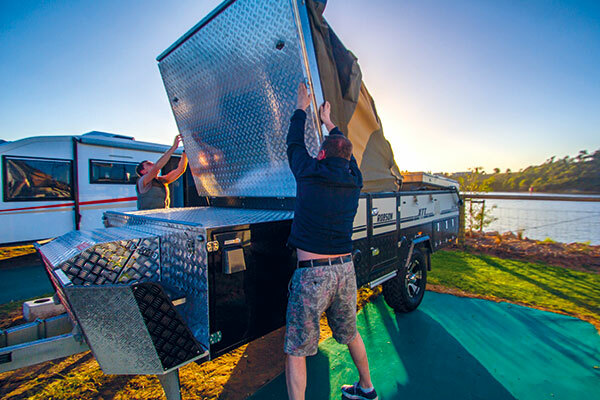 Having missed the Sydney morning traffic, getting out of Sydney was fairly easy, and while we did have to keep on checking how the camper fit through all the narrow lanes, it was more of a mental worry than a real issue. The camper felt wide in the side mirrors but it sat very nicely behind the car. Later in the trip we worked out a trick to deal with the discomfort—we attached towing mirrors to the Mitsi, and while these weren’t required in this instance, they gave us a better view of what was going on behind us. The newly-installed brake controller on my car along with the 4WD 12in electric brakes on the Robson did their job nicely on the hilly and winding roads carved in between the tall gums. The camper pulled up very nicely behind the car whenever we had to hit the brakes, and didn’t try to sway one bit, and despite its weight, didn’t feel like much of a heavy tow. In fact, the fuel consumption calculator noticed the camper attached to the vehicle a lot more than we did, dropping our kms till empty estimate to 450 on our full tank of diesel, down from the usual 850 kms. I guess that’s the price we pay for luxury. We wound the windows down to let the fresh eucalyptus odour fill the space. Oh, bliss... By that time we were well and truly out of the city and the adventure spirit had kicked in. With a couple of roadside stops to admire the views, a lunch and a large supermarket shop we got to our accommodation in Eden post sunset. Having to unpack the camper for the first time in the dark wasn’t our ideal scenario, but luckily it proved to be an easy setup. A couple of buckles, fold to the front; spare wheel down, a couple more clips, fold to the back, extend a couple of poles up to hold up the canvas and we were pretty ready for our first overnighter. 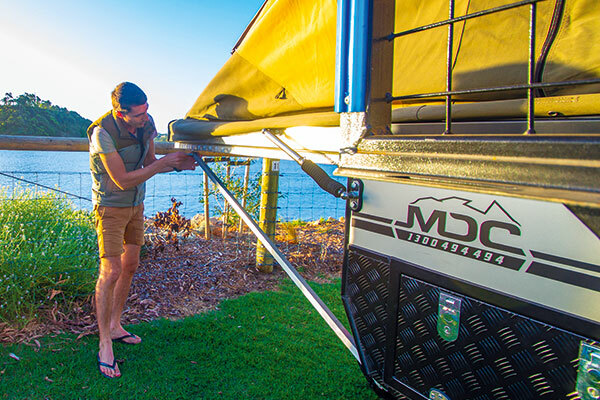 Having the double-fold setup meant that the two double beds are located on either side of the camper, with a lounge area in between—a much needed space buffer when travelling in a group of adults. The folds both have straps, to hold the bedding in, so it wouldn’t get messed up while folding the camper, so once you made your bed the first time, you don’t have to worry about it for the rest of the trip—a small little nicety. The mattress on both is foam, which for me is a down side. I feel like if I am pulling a camper along for the trip, I want the comfort of the innerspring. However, I must confess I’ve slept on far more uncomfortable mattresses while camping and combined with a fluffy mattress topper we’d brought with us, it did the trick for good nights’ sleeps on this trip. The morning starts early in Eden. Being a truly fisherman’s paradise, we heard people get up before 5am to hit the docks with their boats. I zipped the window up. The view didn’t disappoint. The first morning rays of sun filled the camper with light and fresh crisp air hit my nose. Going back to sleep was no longer an option. I decided to test out the kitchen and cook breakfast. I pulled the slide out, connected the gas and everything was pretty ready to go. So far, so good. The early morning enthusiasm suggested I cook eggs for everyone. And coffee… After quite a long driving day the day before and an unusually early wake up we all needed coffee, a real one. Thank goodness for coffee bags—these have definitely replaced the strainer in my camping setup. Having filled our bellies with warm food it was time to pack up and go explore—the only plan we had for the next week and a half. I have to say I really appreciated the hot water system plumbed to the Robson’s kitchen while washing up. And while the sun was starting to hit us with its warm rays, the air was still quite crisp, and having the hot water without leaving the camp setup made all the difference. We packed up almost as quickly as we had unfolded the night before and rolled out of the campsite. We had a shorter distance to cover for the day, so we were in no rush to leave Eden. With all of us being absolute lovers of seafood, the trip to the jetty was a must. We arrived there at around 10am to plenty of action. With a few trucks already in line to get onto the loading dock of the large commercial jetty, and a few fishing boats already back with their load of freshly caught seafood to be delivered to some of the top Sydney restaurants for dinner, there was traffic. We walked around the madness to the end of the jetty, where a few locals had their rods in and it was much quieter and we could admire the vastness of the operation from afar. After another stroll around the area we were ready for lunch. A bit of an Eden must-do, if you’re a seafood fanatic, is a cafe right next to the jetty where they cook up fresh seafood caught that day. To our surprise, the wine list was quite extensive, and being wine snobs of sorts, we couldn’t resist the grigio from Northern Italy to go with our seafood feast. On the way out, we stocked up on a couple of dozen Sydney rock oysters, my favourite type of oysters, which I heavily promoted to the overseas family. A quick stop for fuel, and we were on our way to yet another seafood paradise, this time in Victoria. Once the tall gums gave way to green luscious rolling hills of cattle farmland, we knew we were close. Having arrived in Lakes Entrance way before dark, we were greeted by a family of resident black swans, who decided to hang out right by our camping spot, possibly hoping for a feed. Unlucky for them, we were determined to unpack while it was still light this time, which meant business. The swans must’ve realised that and moved on to their next victims across the road. Once unpacked, we were ready for yet another seafood feast. We got out the oysters, filled our glasses with a local sav blanc and started on the marinara. This really was seafood heaven! I was excited for the next day. We were heading out to easily my favourite spot on the south coast of Australia. A spot that despite its absolute pristine natural beauty stays reasonably free of tourist crowds. Wilsons Prom first won my heart when we passed through on a similar trip Dima and I did back in 2012, along the coast, heading to Sydney. From then on we were in love! Having come back to it a few times, and hiked all around the peninsula, we couldn’t wait to share this hidden gem with the parents. We decided to stay at Tidal River, which, on the down side is the biggest and busiest campsite in the area, but on the upside, it is the most central, offering great access to a bunch of walking tracks. Our first venture was out to the Pillar Point. The walk is quite easy and picturesque. We spot a couple of kookaburras in the trees, while we cross over the Tidal River bridge, where some brave kids are splashing in the water, jumping off and diving, despite the cool autumn weather. We tell the story of the laughing bird to the parents, and just as we finish, the kookaburras decide to demonstrate the unmistakable singing. Once we cross the bridge, the trail heads up, winding its way through the luscious greenery, going inland, then snaking out to the edge of the cliff before winding inland again. This short half hour to 45-minute walk ends with breathtaking views from a huge granite outcrop—with a few boulders serving as vantage viewing points—providing breathtaking views back to Tidal River’s Norman Beach to the left, and Squeaky Beach to the right, as well as to some of Prom’s offshore islands. What a perfect place to enjoy an afternoon! We rolled out our picnic blanket, sat on top of one of the boulders and admired the surroundings. With waves crashing against the rocky cliffs beneath us and the afternoon sun rays reflecting off the splashes of water, making little rainbows, it was easy to be hypnotised by it all. And I must admit, there’s not much I enjoy more than sitting somewhere up high staring into the endless depth of an ocean. While the walking track does continue further and eventually connects a few of the beaches in the area, for us Pillar Point was our final stop— there’s always tomorrow for Squeaky Beach. Having spent a few days on the road with the camper by this point, we were quite good at the whole setup/packdown thing and managed the overnight unfolding in about 10 minutes. 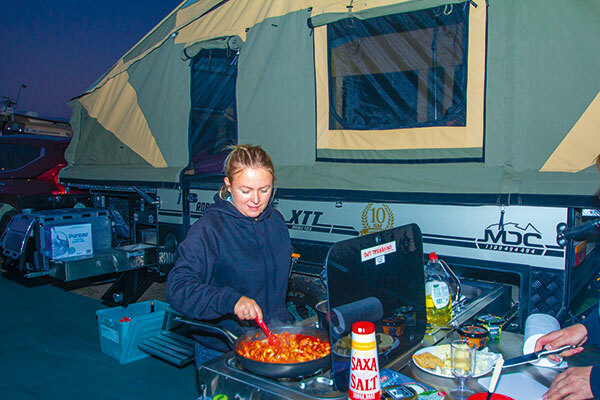 Provided the weather was treating us nicely, we didn’t really need to put out the awning, which would cover quite a large area at the font of the camper, and provide weather protection for the kitchen and pantry. For us, we were lucky—it didn’t rain throughout the whole trip and we quite enjoyed cooking under the stars. Besides, the huge internal U-shape lounge provided plenty of space for us four adults to hide away in comfort and enjoy a few card games come the night, so there was no need for extra external coverage. This same lounge with a wind-down table could also convert into a bed to fit two more travellers, or more, if they were kids. For us, though, we just enjoyed the luxury of having the space to spread out, which being a group of two adult couples, was quite necessary. The following morning we decided to check out Norman Bay from the other side and enjoyed a couple of hours return walk to Normal Lookout. Unlike the track to Pillar Point, this one runs all the way along the coast and offers sweeping views of the bay around each bend. Absolutely captured by the natural beauty of the surroundings our guests wanted to stop to take photos every few metres of the track, and while we’d seen and done this trail a few times before, it’s just one of those places that never gets too boring, so we enjoyed our quite leisurely pace. Surprising for this time of the year, it was starting to get quite warm, and the in-laws, having come from Russia were dying to test the waters of the Southern Ocean, so we headed down to the beach for the afternoon. While all beaches in the area are quite stunning, I do have a soft spot for the absolute white colour and the sound of the sand under the feet at Squeaky Beach—they don’t call it that for nothing! We headed down to water’s edge and yes—it’s freezing! A quick run in—dip—run out routine did it for me! Others proved to be a bit more thick-skinned and stayed longer, but within minutes we were all reunited sitting on the beach, cheers-ing beers to yet another amazing day. From scenic walks, to the scenic drive, Great Ocean Road was a destination not to miss on our way to Adelaide. 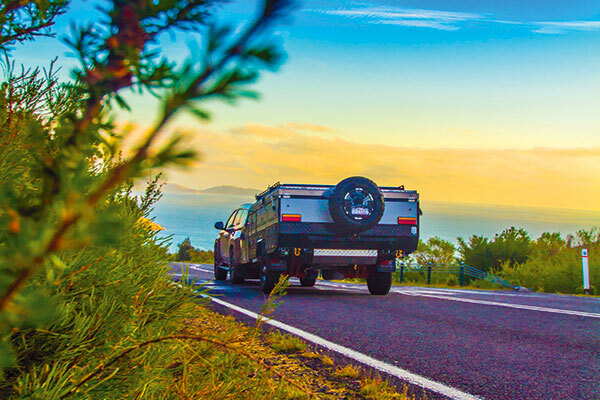 While often taken for granted by fellow Victorians for it’s easy access and the ‘been there a million times’ label, the GOR warrants its place in the world’s most scenic drives list. We aimed to leave early for our favourite fish ’n’ chips lunch in Lorne. The sun was out, skies were blue, as we drove through the twists and turns of this scenic coastal route, stopping in a couple of bays to admire the great views of the of the limestone cliffs and the waves crashing into the rocks. We got to the Twelve Apostles late afternoon, and as per usual, were met by crowds of people; buses and buses of tourists rolling out to snap a selfie in front of the famous postcard landmark. I’ll be honest, the Apostles are not my favourite along the route, specifically for the crowds factor, so we didn’t stay too long. Coming towards the end of the scenic coastal drive, we stopped at a couple more landmarks, including Loch Ard Gorge, London Bridge, The Blowhole, to finally watch the sunset at The Bay of Islands—the last pullover spot for admiring coastal scenery from the top of the cliffs, and probably one of the most beautiful, too. Being too far for the one-day tours from Melbourne, you will never see too many people at that spot, and even at sunset it was just us and two other couples, staring into the sun, the big golden disc, watching it melt into the horizon, before completely disappearing, like it drowned into the endless depths of the Southern Ocean. An overnighter in Mt Gambier, and a quick half hour to admire the Blue Lake, which unfortunately is not as blue this time of the year due to the cooler temperatures of the water, and we were on the way to Adelaide—the place where I grew up. Even though I’ve been calling Melbourne home for the past five years, to this day nothing beats coming back to mum’s welcoming spread of Eastern European cooking, which she seemingly effortlessly rolls out every visit, the real fireplace in the living room and a nice Mclaren Vale Shiraz. It was with that thought that we stopped by Alpha Box & Dice and picked up a couple of boxes of our favourites. Sitting at the round dinner table, with a glass of red, fire crackling in the background, the Adelaide family started quizzing me about the upcoming big day. It was then I realised that it was actually five days away! It seemed a little unreal and seemed that everybody was more prepared for it than me. I went through the checklist again. Things seemed in order. Phew. This round table also meant that our coastal endeavour had come to its end. Where did the time go? I enjoyed sitting there totally absorbed by the surroundings, as I listed to Dima’s mum and dad tell my mum and grandmother about the trip, with huge smiles filled with excitement, trying not to miss a single thing, with faces similar to a little kid’s just stepped off his first airplane flight. I zoned out for a bit. 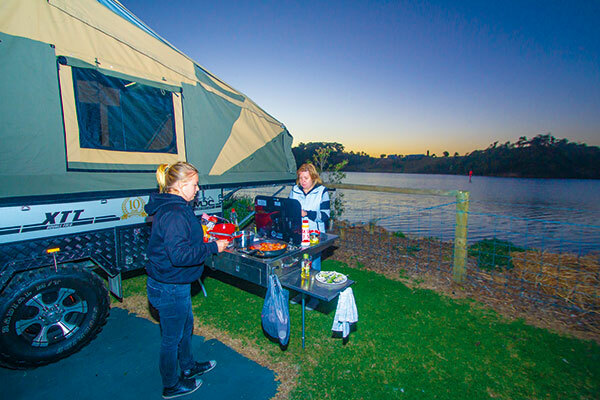 Then, at the end of the conversation I heard the plan of action, “when we retire, we’re going to come back to Australia, buy a camper and do the trip around the whole country!” Well, for someone who’s never camped in their life, they must’ve enjoyed themselves, I thought. Hopefully they do get to fulfill this plan. Hopefully when they do it again, they won’t have the time restrictions we had this trip. While we got to see and do a lot of things, and ticked a lot of destinations off the must-see list, I did wish we had three weeks for the itinerary, instead of two. As for the camper—it did well. Despite being on the heavier side, it towed well, and the load was only really noticeable at the bowser. This was the price we had to pay for spaciousness and the ability to spread out inside the camper—and in our situation it was definitely worth it. The included facilities meant that we could camp anywhere we wanted, cook and have a hot water shower. The two 100Ah AGM batteries kept our laptops, phones and cameras charged with no issues. One thing I did wish, was that the camper itself had more pantry storage, and more storage in general. Being a spacious layout it easily sleeps four to six adults, but to feed four adults and store everyone’s things, it lacks a bit of space. We ended up having a separate pantry tub, as well as suitcases in the back of the Pajero—thank goodness for the large boot. In saying that, if we were to convert the car to a seven-seater, taking away the massive boot space, and travel with a bigger crew, we would have struggled for space to keep our things. While we didn’t go too far off the beaten track, it was nice knowing we could. Needless to say the full offroad independent trailing arm suspension had no issues on the corrugated dirt roads we drove on in some of the national parks. I’d say, the car would need a couple of upgrades though, including better tyres, to be able to pull the weight in a heavy, offroad situation. Also, having electric trailer brakes is great, but it did mean we had to have a brake controller installed on the car before we left. 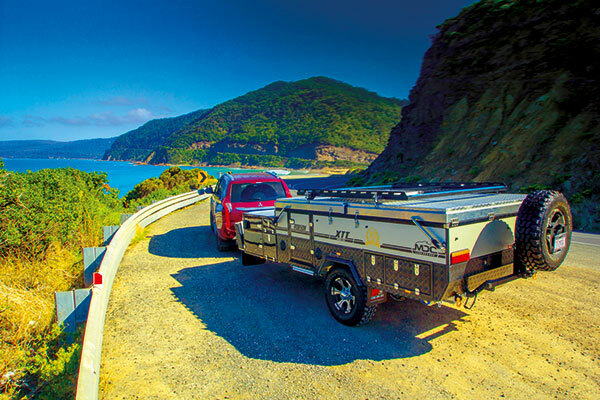 While the electric brakes work much better than your standard mechanical brakes—and give you more control over the camper, increasing towing safety—this addition is definitely something to keep in mind when buying a camper, as it does add to the overall cost of the setup. Having spent a couple of days in Adelaide with the family we packed for our last leg of the trip—back to Melbourne. Mum filled the car and camper to its fullest with ‘all things wedding’ and we were off. The Adelaide to Melbourne route is one we know well and sometimes joke that we can drive that one in our sleep. Eight hours later we were home. Now, to get married, another adventure, perhaps the biggest one of all!